Mikolaj had a breakthrough season in 2018, making 22 appearances and earning a place in the England Knights squad for their tour to Papua New Guinea. He also spent time on dual registration with Featherstone Rovers where he was able to gain further game experience with the Championship club. Mikolaj was a new recruit for the Rhinos scholarship in 2013. He was born in Gdansk, Poland and is a former pupil at Mount St Mary’s High School and is currently studying at Notre Dame Sixth Form College. 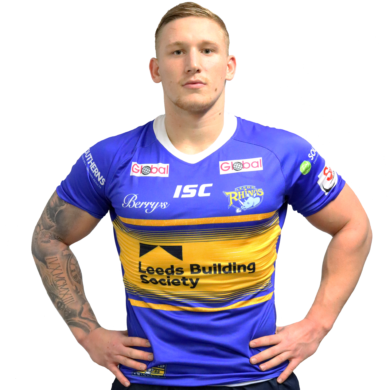 He is a highly regarded player by the Leeds Rhinos coaches and made a try scoring debut that year in the Challenge Cup against Doncaster. He made his full debut that season against Doncaster in the Challenge Cup and then made his league debut away against Castleford. He spent part of the 2017 season on loan with Bradford Bulls. He started his career playing for East Leeds and then went on to play for Hunslet Warriors. He also played for England Youth and England Academy and went on tour to Australia. As well as playing rugby league he is also a talented gymnast and diver and he represented the Poland international team at diving for four years.